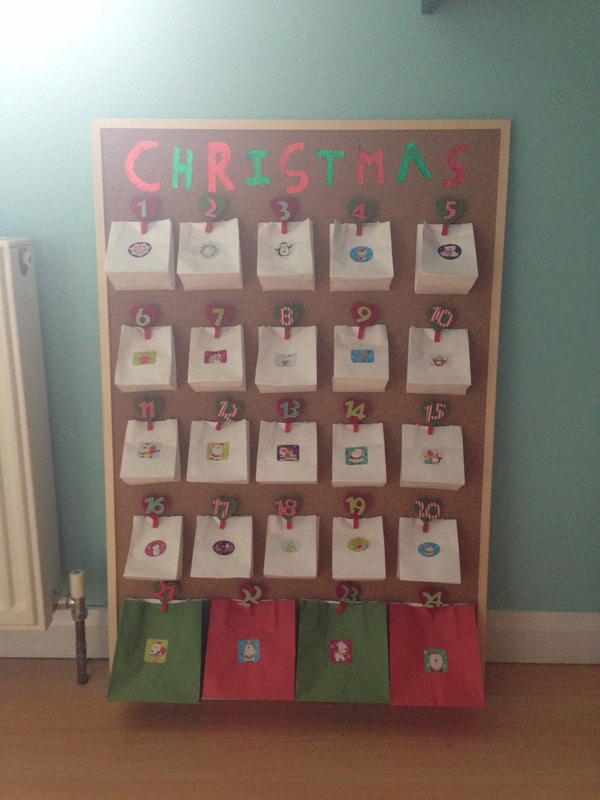 I made an Advent calendar for Dexter this year. Those that know me well, will be reading this and most probably muttering “yeah I bet her Mum made it”. But alas, for the first time ever I have made something without adult supervision or help. Well the OH did a bit of the cutting out, but only because he has lovely slender fingers. 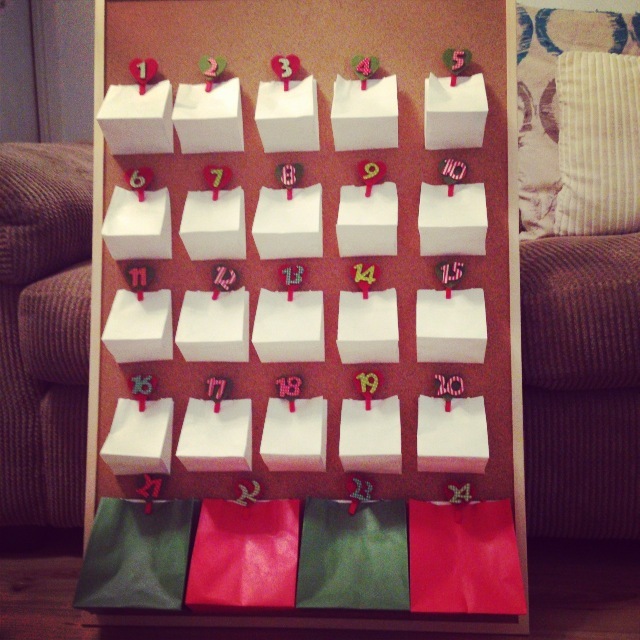 So the advent calendar. I am proud of my efforts and even got an “oh wow” from the toddler when I showed it to him. I put the pictures on Instagram and Facebook and had a bit of interest in how I made it and what I put in the bags. So here’s my first attempt at a “tutorial”. Please excuse the lack of pictures, I wasn’t expecting to have any interest in anything crafted by little ol’ me! I snipped the handles off all the bags before placing them in even rows on the board and marked on the cork board where they were before gluing them on. I opened to bags fully and then glued around the 3 edges, leaving the top section free from the board. The gluing process took a while, this is when I asked the rather artistic OH to cut out some letters to spell Christmas. We debated on using the word “advent” and “Dexter” before settling on Christmas. Who knew what a big decision this would become? Once the glue had dried on the bags, I added the pegs in numerical order (must be my OCD side). The next step was to add the festive stickers and the Christmas letters at the top. The finishing touch was of course adding the treats. A mix of raisins, fruit bites, Haribo, Magic Stars and Lollipops. I hope its something we can use year after year. I haven’t broken the bank to make it, and putting it all together took no time at all. That’s a great idea. Very inventive.